InTruBeauty: Pamper Me Products for a Pamper Worthy New Year! One of my favorite things to do on New Years day is to do some pampering. I especially like to celebrate when I get a day off of work mid-week! That definitely makes me happy. I've picked out my five favorite products for you to pamper yourself in 2014! Four are some of my favorite skincare products, which are so essential for the cold winter months. I've been enjoying showering and exfoliating with LUSH's Rub Rub Rub and adding some much needed moisture with the amazing scent of Laura Mercier's Creme Brulee body butter. 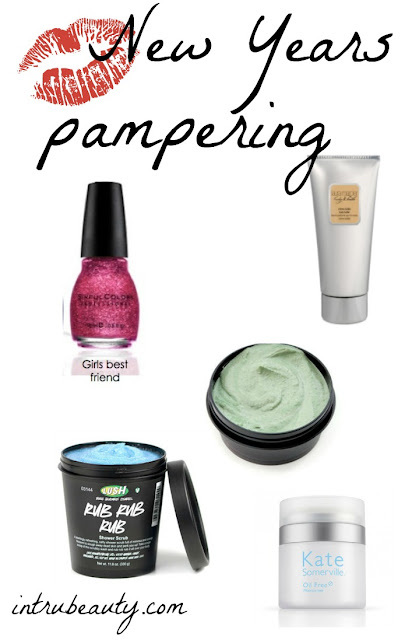 Keep reading for all my pampering picks to start your New Year off right! Inspired by Laura's childhood memories of French Patisseries, this super rich Body Butter delivers the ultimate in hydrating luxury and absorbs quickly into skin. SinfulColors Holiday Tinsel & Sheer Lustre Glitter Topcoat, $1.99 exclusively at Walgreens for Holiday 2013. Balancing mask for all skin types. Love Lettuce is our most exfoliating mask that scoops up dirt, oil and debris and washes it all away. Our rubby scrub is startlingly refreshing, with a dash of lemon juice and the tropical scent of mimosa blossoms for a light, blossom-scented wash and smoother skin. Oil Free Moisturizer absorbs quickly to provide perfectly balanced hydration and moisturization, without any oils. Formulated without parabens or fragrances, this lightweight cream leaves nothing behind but smooth, supple skin.